I was recently asked if there was any sense of community among my fellow bloggers – a term I not quite fond of, but there just isn’t any other way to say it. The question was specifically aimed at the other folks out there who focus on the music of Africa. And at the time, I said ‘No’. But as I started working on this post, I realized that I have had some kind contact – directly or indirectly – with just about everyone who posts music from the Dark Continent on my links page. I think the only ones on there that I have not had any contact with would be the people behind Awesome Tape from Africa, Voice of America’s African Music Treasures and the World Service sites. But I am not so sure that I would use the term ‘Community’. The word that does come to mind is ‘Competition’. Finding the records to post – ones that have not been compiled by the likes of Miles Cleret‘s Soundway Records and Samy Ben Redjeb‘s Analog Africa labels or posted on sites like John Beadle’s Likembe, Frank Gossner’s Voodoo Funk, Uchenna Ikonne’s With Comb & Razor plus the sites listed above – is becoming harder and harder. But that’s not to say that the well has run dry. The Magnificient Zeinians were apparently the first band by Tony Grey – who wrote both of the songs on this record. I have seen one other single by the band, with the song ‘Ije Udo’ on the A side and ‘She’s My Love’ on the flip. Tony Grey went on to record with a band called The Ozimba Messengers. According to With Comb & Razor, he was supposedly known for wearing headpieces with tiger skin and feathers on stage, but is now currently a gospel singer. I had thought maybe that the Ngozi in the song’s title might have referred to Zambia‘s Paul Ngozi, but come to find out that ngozi is the Igbo word for “blessing”. Catalog number HNS 1513 on HMV of Nigeria, no release date given. BLO were the first actual rock band from Africa that I ever read about. I remember seeing their Phases 1972-1982 retrospective on Afro Strut in the Forced Exposure catalog and thinking that I needed to pick that up. But they were sold out, so I bought a disc by Orlando Julius instead. It would be many years later before I would ever get to hear the band. Not until the Q.D.K. Media released their Love, Peace & Poetry: African Psychedelic Music compilation. The band’s name was an acronym for Berkley “Ike” Jones (guitar) and Laolu “Akins” Akintobi (drums) and Mike “Gbenga” Odumosu (bass). Where as most African bands were massive orchestras, BLO were the first rock trio – and really the only one I can think of – in Africa. Jones, Akintobi and Odumosu originally started out in a band called The Clusters while they were still in high school in Lagos, Nigeria. At that time, they were influenced by the British Invasion – The Beatles and Rolling Stones – and then later James Brown. That is until they saw Gerald Pino and The Heartbeats Band from Seirra Leone who were mixing Rock and Roll with Rumba and Soul. After that, The Clusters started to play a mix of Afrorock and Highlife. Eventually, Jones, Akintobi and Odumosu left The Clusters to form Afrocollection with twin sisters Kehinde and Taiwo Lijadu – bettern known as The Lijadu Sisters. Afrocollection decided to move in a more Afrorock direction, and move away from the more traditional Highlife sounds. Around this time, Ginger Baker – drummer of Cream and Blind Faith – was wandering around Africa and happened to catch Afrocollection performing at the Batakuto Club in Lagos. Baker recruited members of the band to form Salt, who toured throughout Western Europe and North America, but never recorded. After the break up of Salt in 1972, Jones, Akintobi and Odumosu returned to Nigeria decided to form BLO. Their first show was on 23rd December 1972 at Onikan Stadium in front of 10,000 fans – the biggest ever audience in the history of Nigerian Music. 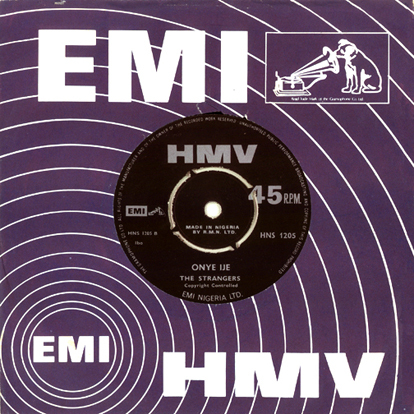 The following year, they released their debut album, Chapter One on EMI. But the record sales did not meet the expectations of EMI, and the band moved to Afrodesia – which was a subsidiary of Decca – for the second album Phase II released in 1975. That same year, the band released Step Three. Mike Odumosu had left the band to join Osibisa and was replaced by Adeniyi “Biddy” Wright on bass, as well as alto and soprano sax. The band was now influenced more by American music groups like Grand Funk Railroad and The Isley Brothers than their fellow countrymen like Fela Kuti and Orlando Julius. But poor records sales pressured the band and Jones and Akintobi decided to call it quits. The duo moved to London to study screenwriting and sound production. That is, until they met session musician Otu Udofa – also known as Lemmy Jackson – who encouraged them to put the band back together. 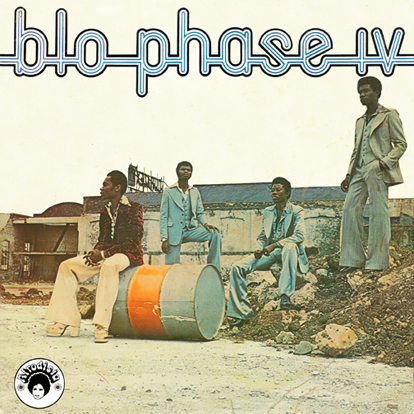 In 1976, BLO released Phase IV. Although Mike Odumosu is pictured on the cover, he was not a member of the band even though supposedly sang backing vocals on the record. The band went on to release two more records – Bulky Backside in 1980 and Back in Time in 1982 – before breaking up for good. According to the liner notes of Soundway Records’ Nigeria Rock Special: “Berkley Jones has not picked up a guitar in years and is now a property developer in Lagos. Laolu Akintobi still produces music and Mike Odumosu settled in London after his days with Osibisa.“ Also, Lemmy Jackson went on to become one of the biggest producers in the Nigerian music industry. Catalog number DWAPS 2009 on Afrodesia / Decca West Africa of Lagos, Nigeria. 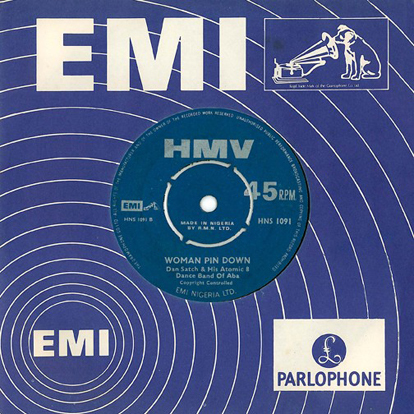 Released 1976, manufactured in England. Dan Satch & His Atomic 8 Dance Band of Aba were from Nigeria, presumably from the town of Aba. During that time, Aba was the capital of the short-lived secessionist state of Biafra. Ferdinand Dan Satch Emeka Opara would eventually go on to form The Oriental Brothers band with his brothers Godwin Kabaka Opara, Kabaka Opara and Christogonous Ezebuiro “Warrior” Obinna along with Nathaniel “Mangala” Ejiogu, Hybrilious Dkwilla’ Alaraibe, and Prince Ichita. The only information I was able to find about this band, was a mention of record by “Dan Satch & the Professional Atomic ‘8’ Band” on a webpage with a discography for the The Oriental Brothers band. That record was released in 1969, while the first Oriental Brothers record did not come out until 1974. Since this original posting, I have been informed about the album “Ikoro’s ’70 Special”. You can find the entire album, plus an extensive biography here. Catalog number HNS 1091 on HMV of Nigeria, no release date given. Update 02.16.2010 – I’ve been meaning to update this post for forever, since I have been told that just about all of the information above is incorrect. Fortunately, the folks over at Waxidermy have posted this single with the correct information. You can find it here. Ofo The Black Company was formed in 1972 by Larry Ifediorama in Lagos, Nigeria. That same year, he took his band to London, England to record their first for London Records. The single with “Allah Wakbarr” on the A side and “Beautiful Daddy” on the B side is highly collectable, usually fetching $100 or more per copy. Allah Wakbar has also been featured on the now defunct Afro Strut label’s Nigeria 70: The Definitive Story of 1970’s Funky Lagos compilation and recently on Luaka Bop’s World Psychedelic Classics 3: Love’s A Real Thing • The Funky Fuzzy Sounds of West Africa. 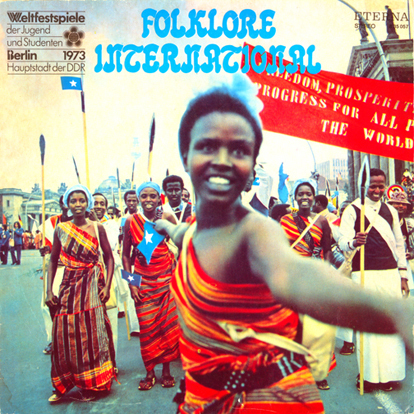 But in 1973, Ofo The Black Company was asked by the East German government to play the “World festivals of the youth and student Berlin capital of the GDR” International Folklore festival in East Berlin along with Miriam Makeba as well as other musicians from Argentina, Bulgaria, Chile and Vietnam. As far as I know, they recorded two singles for London Records, the one mentioned above which was credited to “Ofo The Black Company” and another credited to “Ofo”. They released an album on the Afrodesia label – a subsidiary of Decca – in 1974, which has the song Eniaro that was featured on Soundway Record‘s Nigeria Rock Special: Psychedelic Afro-Rock & Fuzz Funk in 1970s Nigeria. There is also a live record by “Ofo The Rock Company” that was recorded somewhere in Europe. Larry Ifediorama died in 2005 in Lagos, Nigeria. Thanks to Volker Rohde for his help. Catalog number 8 35 057 on Eterna VEB Deutsche Schallplatten, Berlin, East Germany released in 1973. The Strangers were from town of Enugu, which was in the Biafra region of Nigeria. I have heard a few other songs by them, and almost all of them have more of a Motown influence and are sung in English. This song seems to be the exception. Here they are singing in the Igbo language, and sound a bit more like fellow Nigerian and label mate of the time, Fela Kuti. There is an interesting post on Nigeria-Biafra war, and the songwriters from that period here. 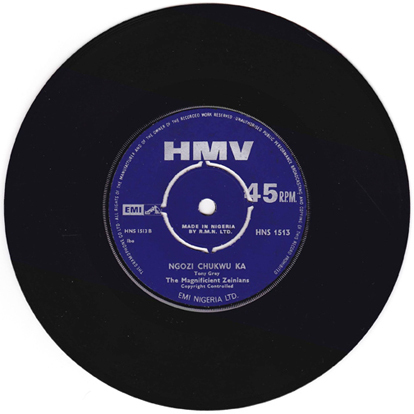 Catalog number HNS 1205 on EMI / HMV of Nigeria. No release date listed.